The book’s cover is not in great shape, but the book itself is wonderful. 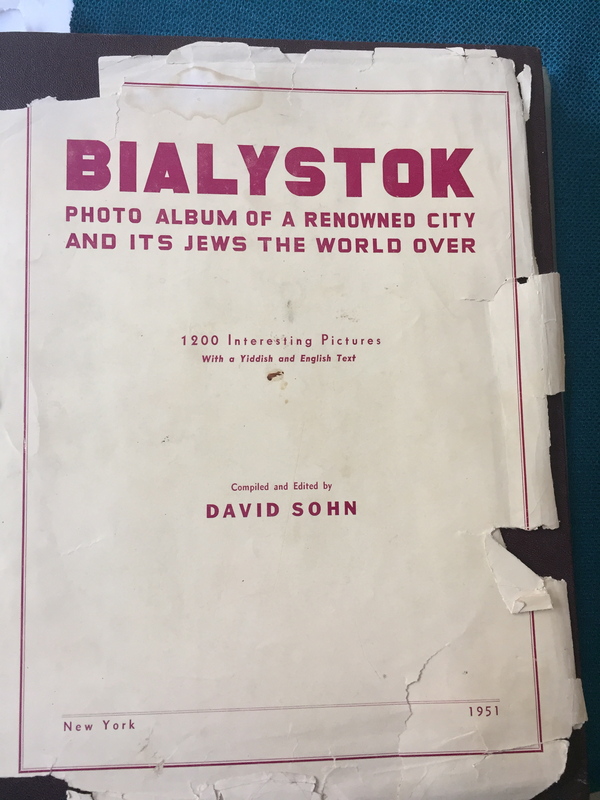 Among the items that became part of my custodial responsibility was the book: Bialystok Photo Album of a Renowned City and Its Jews The World Over. Compiled and Edited by David Sohn, in 1951. The book attempts to show life in Bialystok before World War II; information about the Holocaust and the 60,000 Jews from Bialystok who were murdered; and show that life continued for those who survived and who lived throughout the Disapora. 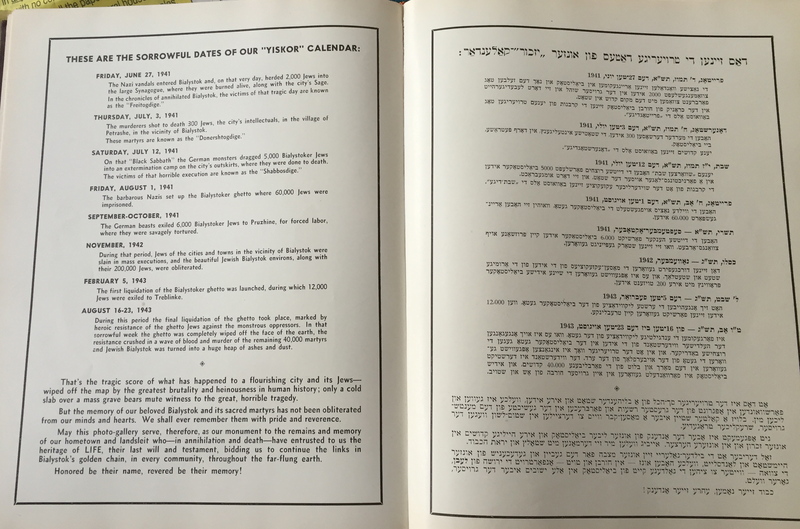 One two-page spread is so emotional as it lists the horrible events that happened to the Jews of Bialystok during the Shoah. 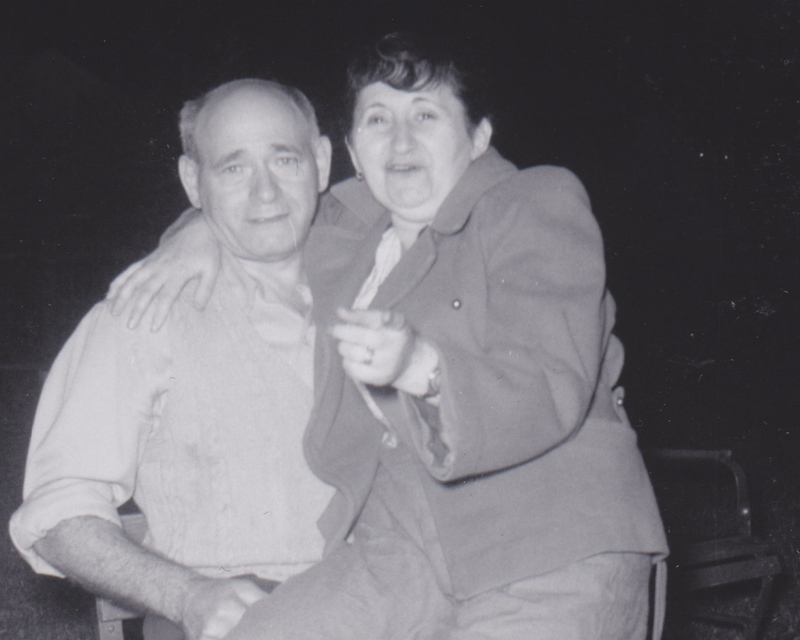 My great grandparents, Louis Goldman (Baruck Lev Litwack) and his wife, Ray Goldman (nee Rachel Wolff) were extremely active in the Bialystok society in New York City and were part of the large number of landsmen from Bialystok who helped to create the Bialystok Home for the Aged in NYC. Although my Great Grandfather died in 1941, my family was still active in the Bialystok organizations in NYC. And my Great Grandmother Ray continued in a leadership role after her husband’s death. I had placed this book in a pile of other books about Europe, but had not really searched through it for a while. I know I looked at it when we cleaned out our parent’s apartment and kept it as something worth investigating. But it went to the side as I dealt with other issues. This week I decided to really look at it and see what I could fine. Thanks to my Aunt Leona, who passed away just four years ago, I did not have to look far. There was a handwritten note from my Aunt, with page numbers and identifications. I loved my Aunt Leona. My Great Great Grandfather, a leading baker. Photos of one set of my paternal great great grandparents are in this book. 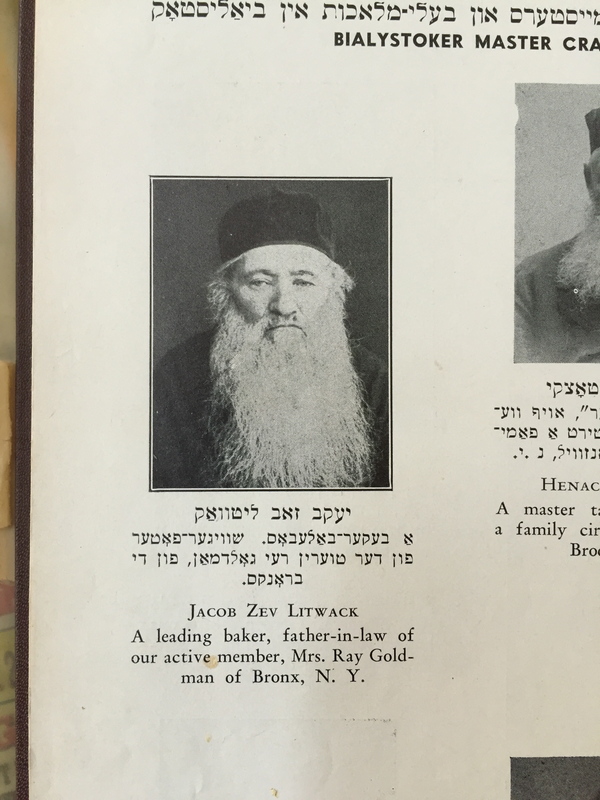 Jacob Zev Litwack and Rashe Goldman were the parents of my great grandfather Louis Goldman. I was a little confused at first because I knew that in Europe my great great grandparents went by the names Yaacov and Rashe Litwack. 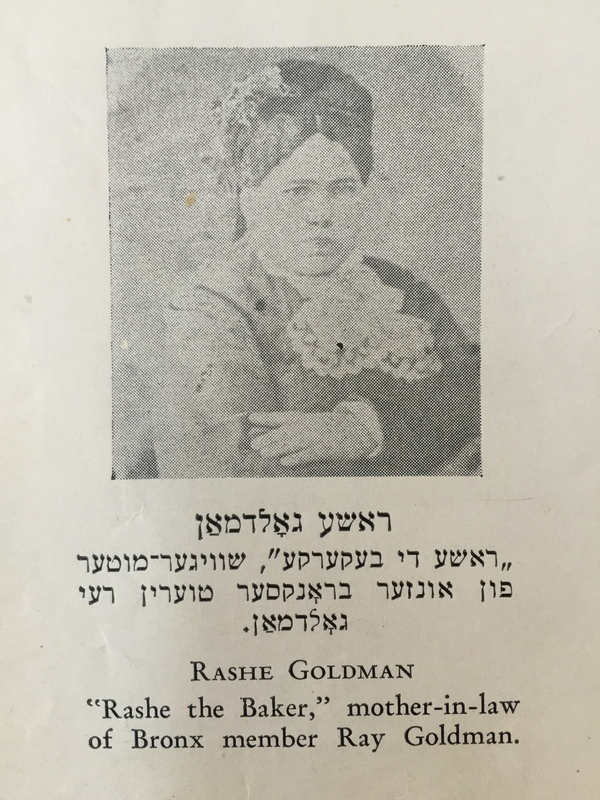 But I realized that Rashe Goldman could be changed for two reasons. First her maiden name was Goldberg, so this could be a mistake. Also, since her son took the name Goldman when he came to the USA, the name on the photo could just reflect his new name. Whatever, the case, my Aunt definitely identifies them as her grandfather’s parents. It is also exciting to see that their occupation is also mentioned: leading bakers. When my great grandfather came to the USA, he became a tailor. There are many photos of my Great Grandma Ray. One by herself and several in group shots. And then there are pages of the “Deceased Leaders of Our Landmanshaft.” On one of those pages is my Great Grandfather Louis. Right there it says, Chairman of Bikur Cholim and a co-founder of the Bialystoker Center and Home for the Aged. It makes me so proud that my great grandparents were so active in tzedakah and good deeds. It is a tradition that continues in our family. So many members of my family have been active in volunteer work for the Jewish community. My Dad was the president of his synagogue for 11 years, and served in many volunteer roles throughout his life. My parents were always supporters of the Bialystoker Home, as were my grandparents. And I like to say that the tradition continues on in my daughter. I think her great great great grandparents would be proud to know that she lives in Israel and works for a non-profit that promotes peace, The Peres Center for Peace. But there was a surprise. There is another Ray circled in the book. Ray Nosoff. I had not heard that name before. But my aunt’s notes came in handy. Ray Nosoff is the niece of Louis Goldman. Her maiden last name was Kramer and her mother was Louis’ sister. She lived in Brooklyn. After googling her name on line, I found out that she was born in 1887 and died in 1966 and was buried in Washington Cemetery in New York. Which makes total sense as my great grandparents are also buried there! I also found the names of her two of her children. This was exciting, as Louis Goldman was the next great grandparent that I wanted to investigate. I had already found out much about his wife, Ray Wolff Goldman. But had not much to go on for Louis. I now know his parents were bakers. His sister also immigrated to the United States and their family was also active in the Bialystok organizations. I have more investigating to do, but I have started on another genealogy journey thanks to another Bialystok treasure. Yesterday my husband and I were on a mission. I had read that the community was holding a major recycling event , the Recycling Extravaganza,” close to our home. This was not for the regular items that we recycle each week. Or for the glass that I take monthly to the recycling center near our home. No this was for electronics, paper that needed to be shredded, household items, fabric and home building items. 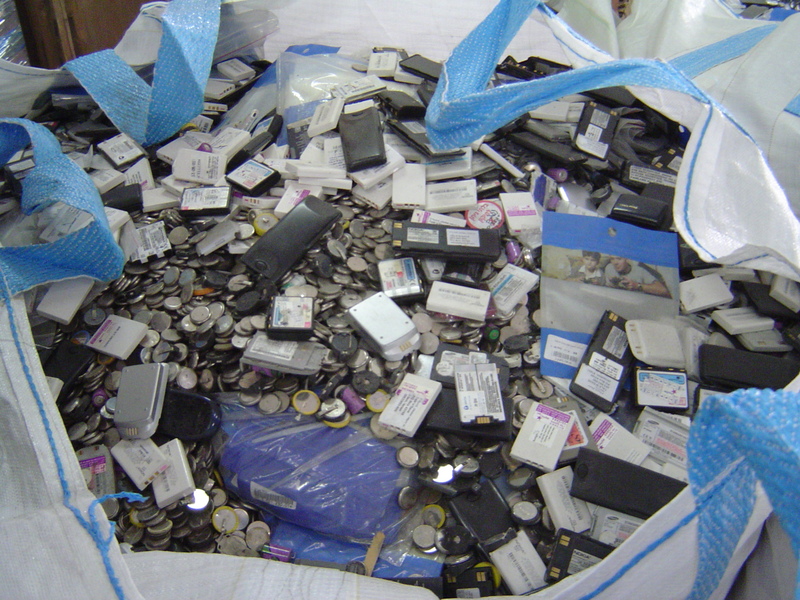 Phones recycled at a cousins’s company in Israel. I am a major recycler. I hate when people throw things away needlessly. In my world of doing good, recycling is one of the most important to keep the world clean and preserve resources. We even have cousins who own a recycling company in Israel! 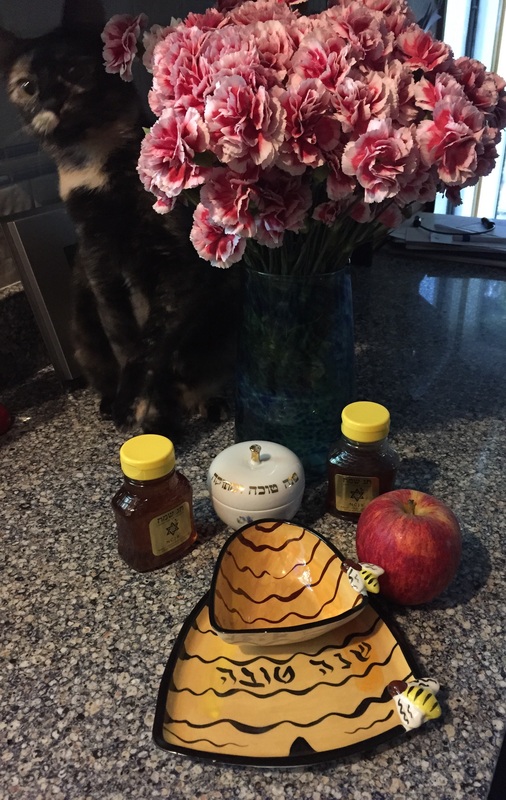 It is one of the small things we all can do to practice Tikun Olam, repairing the world. For me recycling is a form of ‘tzedakah,’ rightousness. I was ready. I have been saving electronics for months. I had two old televisions, VHS players, old recorders and other sundry electronics ready to go. I also had the pedestal sink that was removed from a half bath during a remodeling. I figured I had close to 90 pounds of items to go! And that was important because whenever they talk about recycling, the newspaper always says how many pounds was collected. We were doing our little part to help. So first we loaded my little C-Max Hybrid with all the electronics and drove the three miles to the parking lot of a local business. We just had to follow the signs and the cars. Soon we were directed by a volunteer to the right to join in a long line that led to the electronics recycling.ALl of these items will be recycled by Surplus Exchange. Every few minutes the line moved forward as four cars at a time were emptied by volunteers. It made me so happy to see so many teens participating and helping to empty the cars. What a great service project to do on a weekend! You might hear about teens getting in trouble, but how often do you hear about teens doing community service! This added to my feeling of wellness. Teens doing good deeds, gemulat chasidim. Within minutes our car was emptied. My husband just stood on the side and watched. He did not have to do anything. The teens were like busy carpenter ants just scurrying around and taking out the items from our car and the other cars lined up near us. We then joined the line of cars leaving the parking lot. Our drive home was fun. I said, “I feel as if the house is lighter with all that gone!” My husband was more excited about emptying out the garage. “We need to go back with the sink. It just takes up too much room in the garage,” he said. Of course we were going back! Recycling was my mission for the day. He loaded the two heavy sink pieces into the trunk of my car. We drove back to the parking lot. This time we were directed to go left. “They will be so happy to see you,” the woman directing traffic told us! There was not a long line leading to the recycling trucks that took the fabric, household goods and other items. But we were soon stopped. A car in front of us was filled with 2 by 4s that needed to be emptied. We were two trucks away from the truck that was used for collecting our item. Two young men who were working another truck came to help my husband. (I think the grey hair helped.) They removed the two heavy parts of the sink and carried them over to the ReStore truck. We were done! Recycling completed! Mission accomplished. Our house was lighter. Our items were not in a land- fill but rather would be used by others or taken apart and recycled. Tikun Olam, repair the world. I might not be able to control all the world’s crisis, but I can no my little part to keep the world a cleaner place. Recycling really does give me a wonderful feeling. Is Lassana Bathily, The French Hero, a Lamed Vovnik? Since I was a teen, I hoped that I could be a Lamed Vovnik, one of the 36 righteous or just people who keep balance to the world. Of course in Jewish mysticism, the 36 are men. But in my modern mind, I believe that a woman has just as much chance of being one of these 36 special people as any one else. I first learned of the Lamed Vovnik legend when I read the Holocaust novel, The Last of the Just, by Andre Schwarz-Bart. This book had a tremendous impact on my life. As I read about these two just men and the trials they suffered, I felt a kinship. I felt a need to bring good into the world. And that is how I live my life. I try to find something good in everything that happens. Every event is a learning experience. Every one I meet teaches me something. I focus on the positive, just as I think a righteous person should. I focus on the spark of God that is inside each one of us. I try to do gemulat chasidem, good deeds. I try to work on tikun olam, repairing the world. Just as I think a Righteous Lamed Vovnik would work. That there are 36 righteous people is important. Each Hebrew letter has a number attached to it. The letters for the number 18 are Het and Yod. These two letters together form the word, Chai, or Life. So many Jewish people present gifts to someone in multiples of 18. There are 36 righteous Lamed Vovnik, which is twice Chai, twice life. Think: upstairs in the grocery as Black Muslim man was shooting and killing Jews just because they were Jewish. He killed four. But two stories below a Black Muslim man was saving Jewish people, hiding them in a freezer. Balance! Upstairs and man was hiding from the police. Downstairs, a man made the decision to go to the police to tell them about the Jews hiding downstairs. Balance! He left the building. It took time for the police to believe. And thanks be to God, they did. With him was a key to the metal gate, as well as in his mind a key to the layout of the store. Lassana Bathily brought balance, love and righteousness to a horrible situation. To me he is a Lamed Vovnik, a righteous man. A guttah neshumah, a good soul. And a mensch, a man of high standing. Baruch Dayan haEmet . May the names of those who perished always be for a blessing. But the name of Lassana Bathily is also a blessing because he provided safety for those who lived. The spark of God within him shines! For the past week I have been writing checks. It is the time of year when every charity I have ever donated to sends me reminders. Many of them I give to throughout the year. But at the end of the year, as much as my husband and I are able, I give more: to Harvesters, the food bank; to domestic violence shelter, to organizations that help children; to Jewish charities, to schools. The list goes on and on. I was taught that you have to give to others. Not just money but time. Volunteering is an important part of my life. In the years when I was not working, I volunteered so much that it seemed I had several jobs. Yes I do have favorite organizations I for which I do most of my volunteering. But there are many that I do one-time events when asked by friends. My favorite volunteer job is chairing a scholarship committee for the Greater Kansas City Section of National Council of Jewish Women. I became a member of NCJW because of scholarship, and I recently realized that I have been on this committee for almost 30 years. WOW. As chair, I keep my committee going. Our numbers had fallen. But over the past three years, I have been able to have six or seven new members join. And this past year, I have gone after even younger women. We need continuity. Keeping the scholarship committee alive and well is important to me. Each year we provide college scholarships for almost 30 students. They come to us first as high school seniors. And if they get our scholarship, they can continue it for all four years of college as long as their grades are relatively good and they still have financial need. Over the years we have provided many scholarships for students who are the first in their family to go to college. And many have had hardships that make the committee members want to cry. As chair I am fortunate to read all the thank you notes that they send. And see the difference we have made in the lives of these students. I often wondered when did the importance of volunteering and helping others first become so important to me? I honestly cannot remember a time when I was not involved in something. In high school I was a Candy Striper, a hospital volunteer. In college, I chaired and served on many committees to help others, including the first ever Orientation Committee. Even my jobs have focused on not for profit work. It is in the essence of my soul. My father was the president of his synagogue for 11 years. I think this has to be a record! My parents helped people and taught us to care for others. It was important to them that we had a ‘gutah neshama,” a good soul. It was important to be a mensch. Giving to others; understanding Tzedakah, righteousness, was important. My Grandparents in the Catskills in July around 1954. It was my Grandma’s birthday. Today I received an email that shook me up in a way and made me realize that the need to do tzedakah came not just from my parents, but also my grandparents. I have to be honest, I cried. My grandparents were very quiet people. But I already knew that during the Great Depression, they allowed many people to buy groceries and bread from their bakery on credit, even though they knew they would not be paid. My Mom told us the story of people coming back years later to pay their debts. But I never knew that they had allowed people to pay off the summer rent during the year. This was a major mitzvah. The cities in the early 1950s were not safe for children in the summer time; it was the season of polio. I always knew my grandparents were righteous people. And I know now that giving tzedekah is entwined in the essence my soul from my parents and my grandparents.